No 3G or Wi-Fi - can the Asha survive in today's world? The Nokia Asha 201 is a low cost 'feature phone plus', let down by the absence of 3G and Wi-Fi but lifted by a good keyboard and impressive battery life. Nokia might be pushing at the high end of the smartphone world with its Lumia 800 and Lumia 710, but the company also has a budget series, Asha. The Nokia Asha 201 is designed for the chatterbox. And costing around £65 SIM-free it sounds like a steal, with its QWERTY keyboard just crying out to be typed on. Our sample came from Vodafone, which sells it for the even cheaper UK price of £45 on pay as you go. At that price you clearly have to expect some less than stunning specifications. Probably the lack of 3G and Wi-Fi will put many people off immediately. And then there's the small screen (320 x 240 pixels), and the rather old hat Symbian S40 operating system that holds everything together. But that low price beckons, and there's a quoted seven hours of 2G talk time from the battery to lure you too. You've got various colours to choose between depending on where you buy from, with eye-watering shades of green, blue, pink and orange all in the mix as well as more standard, and less frightening black and white. 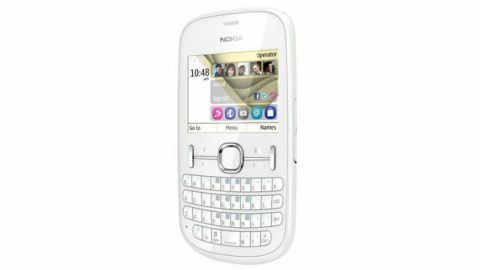 The Nokia Asha 201 is a smallish handset considering it totes a mini QWERTY hard keyboard, and light too, thanks to its plastic shell. At 105g and measuring 115.4 x 61.1 x 14mm, it's a good size and weight for small hands and pockets. We bet that youngsters are high on its target list. The build is reasonable, but not outstanding. The plastic feels solid enough, but on our white sample we could see the join between the pearlescent white backplate and the edges of the phone, which we found irritating. There's a microSD card slot on the right edge, under a hinged cover. You'll need to use this to boost the 10MB of built-in storage. Other than that, all the ports and connectors are on the top, with the bottom and left edges clear. So, the top edge has headphones connector, USB port and a connector for the tiny round pin Nokia mains charger. No, you can't charge over USB. There's no volume rocker or shortcut button for the 2MP camera. Meanwhile, the front of the Nokia Asha 201 houses a physical mini QWERTY keyboard and a nice arrangement of buttons. The central D-pad has a ring where the top and bottom edges move you through the main screen (it's not a touchscreen), while a press on the right edge takes you to the calendar, on the left edge to messaging. Two soft menu buttons offer various changing functions, and there are two shortcuts, one to the web (via Opera Mini), and one marked up for messages but which you can customise. There are also Call and End buttons. It's nothing special, but it is all quite neat.